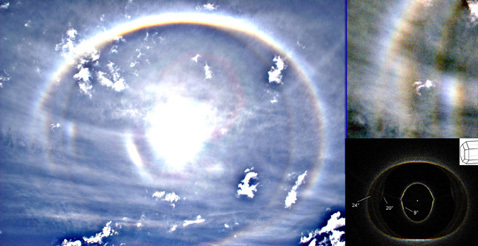 This display with 24°, 20° and 9° column arcs was observed at 10:47 on 29 June 2008 near Tselinograd by Konstantin Bespalov. The original photos can be found here: ( 1 - 2 ), and a simulation of this display by Marko Riikonen here: ( 3 ). When sending that simulation to Vladimir, forgot to mention that it was made with Jukka Ruoskanen's software. Anyway, in the photo are seen very clear cut sections of pyramidal column arcs, especially from the upper part. It is as if part of the cloud containing normal columns suddenly has shifted to different growth environment, making pyramidal ends to columns (only the depicted crystal population was used in simulation). Perhaps an airplane passing the cloud could have caused this - it would explain the abruptly cut upper edge to the odd radius column arc, which is upwind. This put me thinking also about the odd radius column arcs in general. Normally pyramidal crystals are pretty spherical, reflecting their formation history from a frozen water droplet, and they cause either circular halos or plate arcs. Pyramidal column arcs are the rarest group of pyramidal halos, especially in diamond dust. Maybe this is because column arcs crystals do not readily grow over the frozen droplet, but instead they need first normal column growth in one environment and then addition of pyramidal ends in another.